Sub: SSA, Guntur – Outsourcing & Contract Services – Married Woman employees – Sanction of 60 days paid Maternity Leave – Certain instructions issued. Ref: 1.Go.Ms.No.53, dt.01.05.2018 of the Finance (HR-I.Plg-Policy) Department. 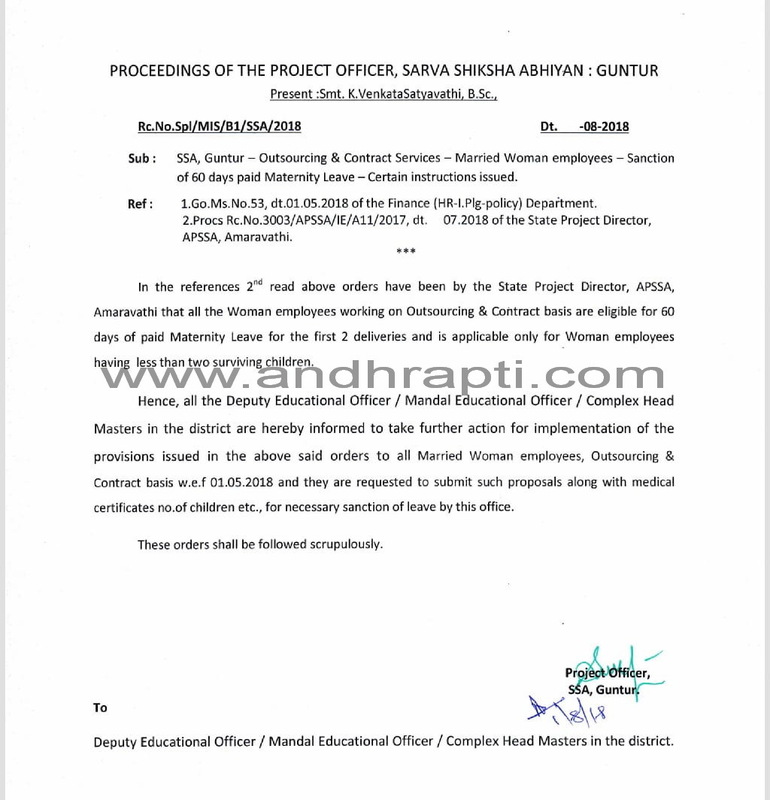 In the references 2nd read above orders have been by the State Project Director, APSSA, Amaravathi that all the Woman employees working on Outsourcing & Contract basis are eligible for 60 days of paid Maternity Leave for the first 2 deliveries and is applicable only for Woman employees having less than two surviving children. Hence, all the Deputy Educational Officer / Mandal Educational Officer / Complex Head Masters in the district are hereby informed to take further action for implementation of the provisions issued in the above said orders to all Married Woman employees, Outsourcing & Contract basis w.e.f. 01.05.2018 and they are requested to submit such proposals along with medical certificates no.of children etc., for necessary sanction of leave by this office. These orders shall be followed scrupulously.